Cowgirls Rule! Yes, as a matter of fact they do! This pink background sign measures 4.5x24 and comes with the grass rope hanger for easy hanging. Handcrafted with pride!! Little Buckaroo! 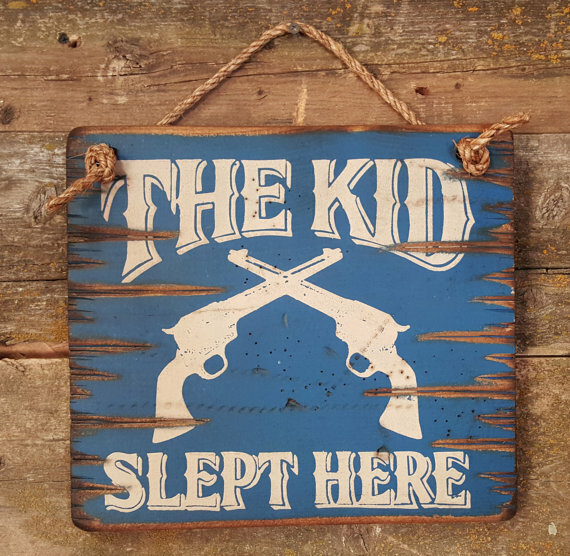 Hang this on the wall of your special little buckaroo! Background of sign is green and measures 4.5x24 and comes with the grass rope hanger for easy hanging. Handcrafted with pride! Dear God, Please Tell Mama Cowboys Don't Take Baths! 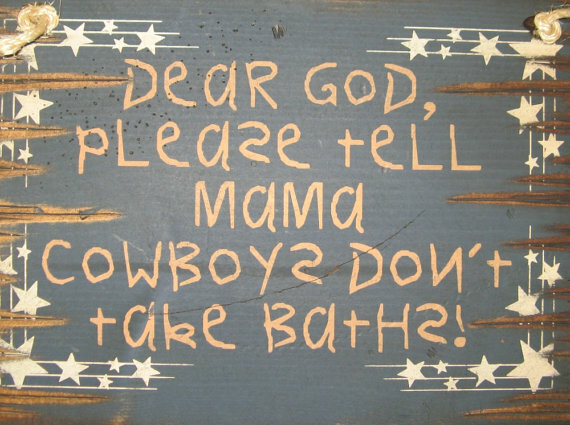 Dear God, Please Tell Mama Cowboys Don't Take Baths! Hang this up in your kid's bathroom to remind yourself why your little cowboy doesn't like to take baths! This navy background sign measures 11x15 and comes with the grass rope hanger for easy hanging. Handcrafted with pride!! Cowgirl Princess! It's as simple as that!! Display this sign in your little princess' room!! Contact me to change the color to match the decor in your home! This light purple sign measures 4.5x24 and comes with the grass rope hanger for easy hanging. Handcrafted with pride!! Yippee Yi Yo, Watch Me Grow! This measuring stick can chart the progress your little "buckaroo" is making as he/she is growing! Hang the measuring stick 2 feet off of the ground, with the included scews, and start measuring away! Button plugs are sent to match the stick's color and cover the screw. Choose from our long list of colors, or send a custom color request. This is a great gift for a baby shower, child's birth, or a child's birthday! My kids love theirs!! 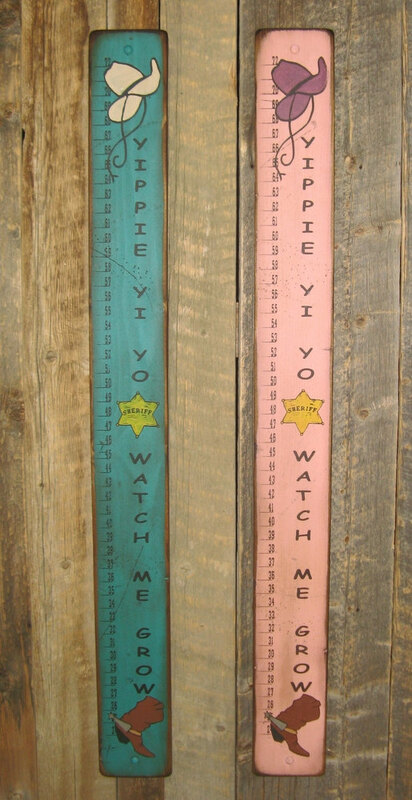 The measuring stick measures 5.5x54 inches. Handcrafted with pride! Howdy Partner! Hang this cute, red wooden sign in your child's room or in your entry way to welcome your guests! This sign measures 4.5x24 and comes with the grass rope hanger for easy hanging. Handcrafted with pride!